Flies won't bother my dog after giving her Brewer's Yeast Garlic by Thomas Labs, best product ever. 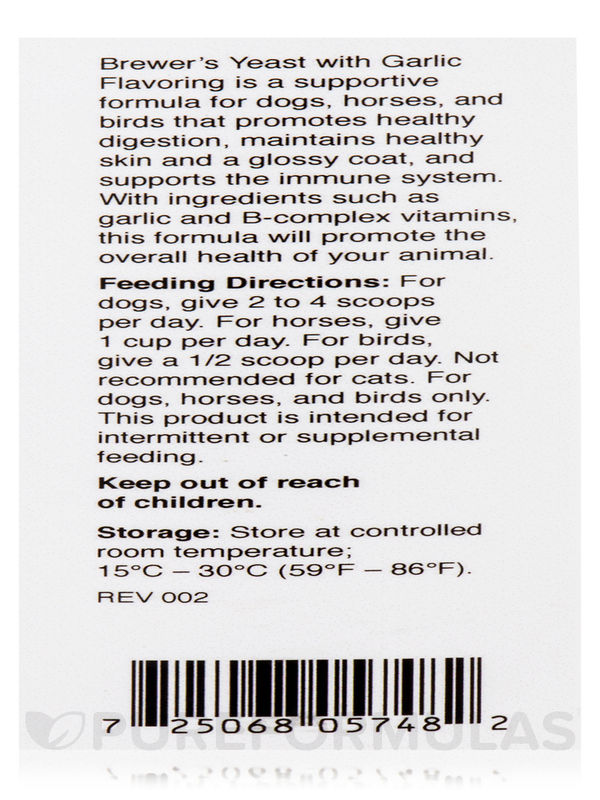 I ordered Brewer's Yeast/Garlic by Thomas Labs for my cats even though it is not recommended for cats, it helps control fleas. I found it online and the price was best yet and yes I will order it again. 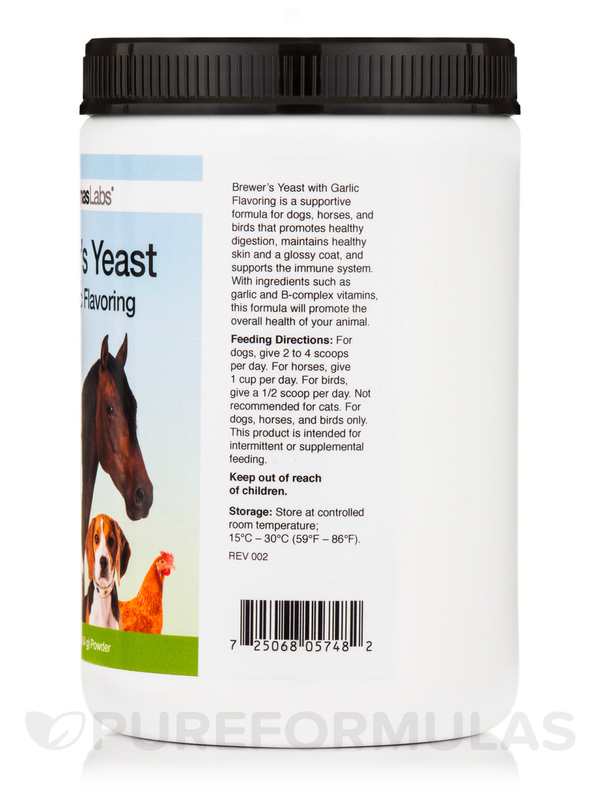 Brewer’s Yeast Flavored with Garlic is a supportive formula for dogs‚ horses‚ and birds that promotes healthy digestion‚ maintains healthy skin and a glossy coat‚ and supports the immune system. With ingredients such as garlic and B-complex vitamins‚ this formula will promote the overall health of your animal. Everybody needs a little help keeping things running smoothly from time to time‚ and our dog‚ horses‚ and bird friends are no exception. When they need that extra support‚ Brewer’s Yeast Flavored with Garlic from Thomas Labs is what they need. 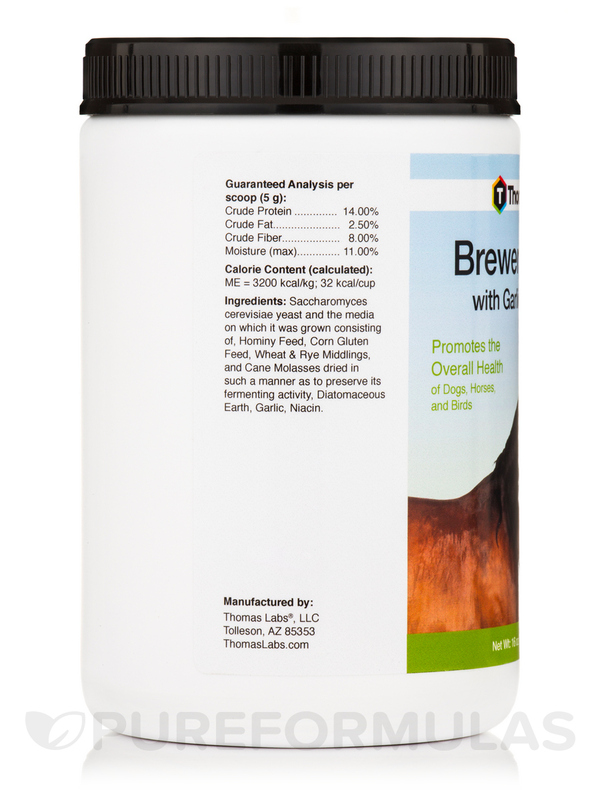 Brewer’s Yeast Flavored with Garlic is a supportive formula that promotes healthy digestion‚ maintains healthy skin and a glossy coat‚ and supports the immune system. By using an array of helpful ingredients such as B-complex vitamins‚ selenium‚ chromium‚ and vital amino acids‚ this formula will support energy levels and help maintain normal shedding to produce a healthy coat. The inclusion of garlic can have antioxidant and immune-supporting effects. 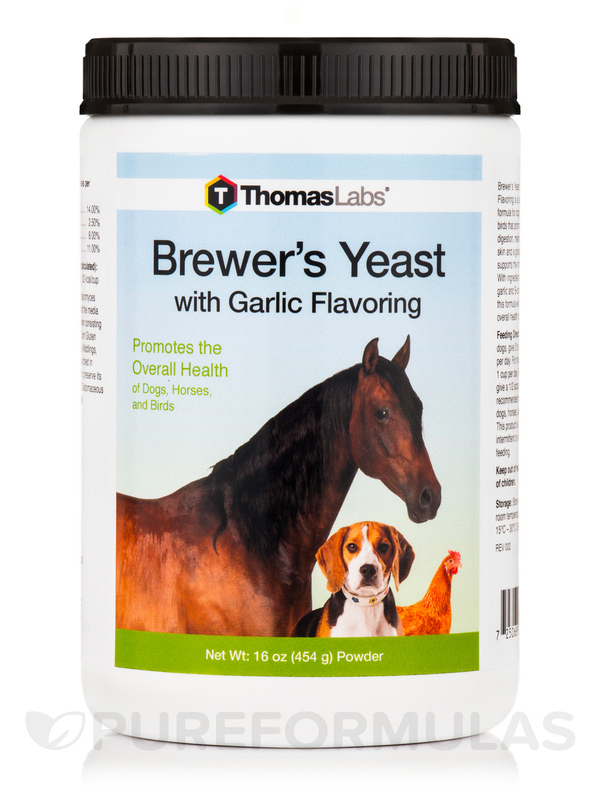 If you’re looking for an easy way to promote the overall health of your pet‚ choose Brewer’s Yeast Flavored with Garlic from Thomas Labs! Ingredients: Saccharomyces cerevisiae yeast grown on a media of ground yellow corn‚ Hominy feed‚ Corn gluten feed‚ Wheat & Rye middlings‚ Diastatic malt and Corn Syrup‚ Cane molasses dried in such a manner as to preserve its fermenting activity‚ Garlic‚ Diatomaceous Earth. For dogs‚ give 2 to 4 teaspoons per day. For horses‚ give 1 cup per day. For birds‚ give a 1/2 teaspoon per day. For dogs‚ horses‚ and birds only. This product is intended for intermittent or supplemental feeding. Store at controlled room temperature; 15°C - 30°C (59°F - 86°F). 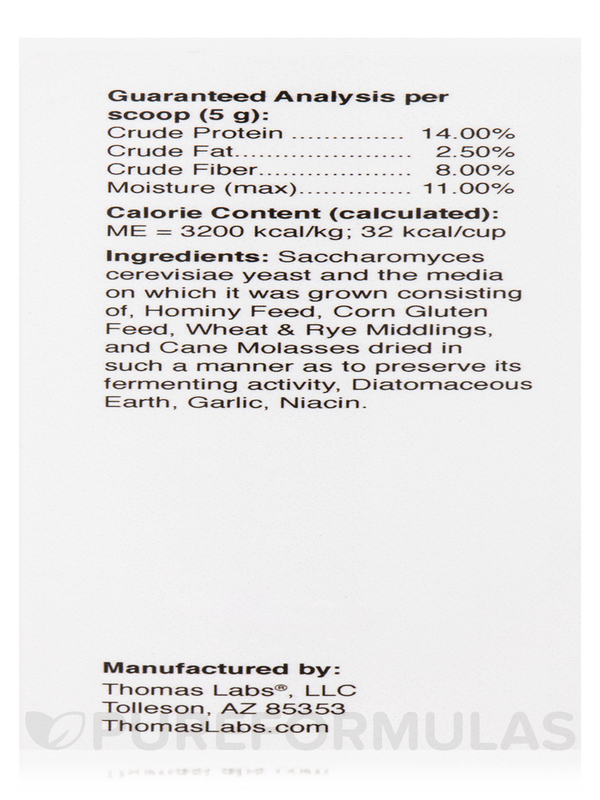 I use Brewer's Yeast/Garlic by Thomas Labs all the time with my two dogs and cat. Yes, I give a bit to the cat as well and it works well for all of them. I've had NO problem with fleas at all, even in the hottest weather, with this product. I will keep using this always. It also gives a healthy shine to their coats as well. It helps control fleas on several cats I feed. Your price is the best. I dislike nothing about this product. Easy to mix, doesn't have strong odor. Quick and easy and really like the NO SHIPPING COSTS ! !